BISS 7.19.11 - New Mastersounds / Materialized / Make A Scene / EMT / Albino!! Happy Tuesday BISS Listers! Yes, we are early this week. 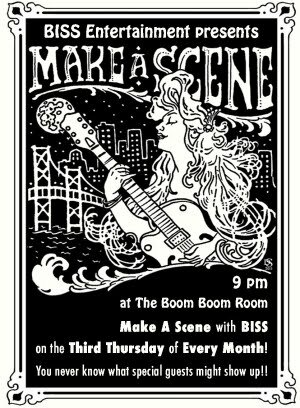 It's a very BISSy week for live music in SF with NMS on Tuesday, Materialized on ednesday, Make A Scene on Thursday, EMT on Friday, and Albino! on Saturday! Wait...what was all that again? for a chance to *WIN TICKETS* today! Speaking of the amazing Far West Fest, Brick & Mortar, and BISS...MATERALIZED rocked the same stage at Far West Fest as The New Mastersounds and now rock the same stage at Brick & Mortar Music Hall on Wednesday night. Early show with special treats! 8pm, $5 - Presented by Star Sapphire Events, Biss Entertainment and BISS List!! And speaking just once more about The Far West Fest, thank you & congratulations to Adrienne Pfeiffer and crew for topping yourselves again this year with another amazing Far West Fest event!Nice job Andi Grossman White on the acoustic stage. Thanks to Sarah Hamilton & her wonderful team for the massages! Gratitude to Local Music Vibe for the fab VIP treatment! BISS List and Biss Entertainment are honored to have been a part of it all! "Bill Graham Civic Auditorium, San Francisco, CA"
"John Collins: 138 Minna Street @ New Montgomery, San Francisco, CA"
"McNear's Mystic Theatre, Petaluma, CA"
Peter Eden is continuing our popular Jazz Jam session that began at Epicenter.